Risky assets are higher today, because of cut in China’s reserve-ratio requirement over the weekend by 50BPS to 20.5%, effective from February 24th. That means that banks are now allowed to lend more money, which of course is good for economy. That’s why we saw a gap higher on commodities, stocks and lower on USD dollar; against the majors, as usually in Risk-on situation. Finance ministers from the Eurozone are expected to approve a rescue package for Greece today, which is also supportive for the risk trade. USD/CAD continued to engage in choppy sideway trading above 0.9926 last week. The development suggests that price actions from 0.9926 are merely consolidations. And with 1.0070 minor resistance intact, near term outlook remains bearish. Initial bias remains neutral this week and some more consolidation could be seen. But downside breakout is in favor and below 0.9926 should target 0.9891. 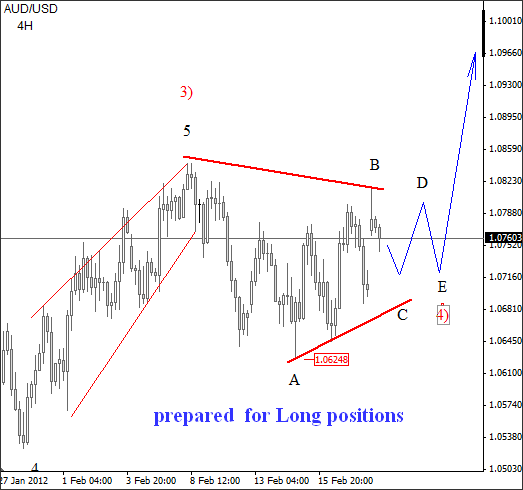 Break there will also resume fall from 1.0656 towards 100% projection of 1.0656 to 0.9891 from 1.0522 at 0.9757. In any case, we’ll stay bearish as long as 1.0070 minor resistance holds. In the bigger picture, a medium term bottom is in place at 0.9406 and price actions from there could either be consolidation to fall from 1.3063 or the third leg of the whole consolidation pattern from 2007 low of 0.9056. We’re favoring neither case for the moment. Firstly, we’d expect 0.9406 to hold for a while at least. Secondly, the eventual pattern of the price actions from 1.0656 would decide whether rebound from 0.9406 is going to extend higher, or USD/CAD is just gyrating in range. We’ll stay neutral first until the pattern from 1.0656 finishes. In the longer term picture, there is no clear indication that the long term down trend from 2002 high of 1.6196 has reversed even though bullish convergence condition was seen in monthly MACD. Current development dampens the case that fall from 1.3063 is resuming the such down trend. But there is no change in the long term bearish view so far. A break of 0.9056 low is still anticipated after all the consolidative price actions complete. AUD/USD engaged in consolidative trading below 1.0844 last week. Note that AUD/USD is still staying inside near term rising channel, and thus, there is no sign of topping yet. Above 1.0855 will resume recent rally and target a test on 1.1079 high. However, note again that firstly, upside momentum is weak with daily MACD staying below signal line. Secondly, rise from 0.9663 could indeed be a leg of the consolidation from 1.1079. A break below 1.0628 minor support will indicate near term reversal and should flip bias to the downside for 1.0377 resistance turned support and below to extend such consolidation from 1.1079. In the bigger picture, the up trend from 0.6008 (2008 low) is still intact. Price actions from 1.1079 are treated as consolidation in the up trend only. In any case, with 0.9387 support intact, an eventual upside break out is anticipated, for a new high above 1.1079. However, break of 0.9387 would possibly bring deeper pull back towards 0.8066 key support before the long term up trend finally resumes. In the longer term picture, whole up trend from 0.4773 (01 low) extended to a point where it just missed 100% projection of 0.4773 to 0.9849 from 0.6008 at 1.1084. At this point, there is still prospect for a lengthier medium term consolidation. But there is no indication of long term reversal yet. We’ll stay bullish as long as 0.8066 support holds and expect an eventual break of 1.1084 to 138.2% projection at 1.3023, which is close to 1.3 psychological level, in the long term. The Euro corrected to my 1.3000/1.2975 target yesterday (as advised in my FX Trading Service to subscribers world-wide) and today I am again bullish on the Euro at 1.3085/1.3070, for the resumption of uptrend toward my next target at 1.3320/1.3350 (eventually much higher!). On Thursday Dollar/Yen resumed increasing with 60 pips. The currency couple appreciated from 78.35 to 78.96 yesterday, not matching the negative Interbank sentiment at almost -14%, closing the day at 78.89. This morning the Dollar climbed further against the Yen, reaching 79.18. On the 1 hour chart the upward channel looks good, while on the 3 hour new upward channel has formed. Break above today’s top and nearest resistance 79.18 would encourage further recovery of the Dollar. Immediate support is yesterday’s bottom at 78.35, and consistent break bellow it could strengthen the Yen further down towards next target 77.50. There are no major economic events for Japan today. Quotes are moving just above the 20 and 50 EMA on the 1 hour chart, indicating slim bullish pressure. The value of the RSI indicator is positive and hesitant, MACD is positive and tranquil, while CCI has thinly crossed up the 100 line on the 1 hour chart, giving over all light long signals. The sterling has followed suit in yesterday’s session and jumped from the zone at 1.5670 to the proximities of 1.5820 on the upbeat news from Greece and the possibility of a swap in the ECB holdings of Greek bonds. Market sentiment shifted to risk-on trade after the first half of the session in Europe, where risk aversion has prevailed, propelling the high-yielders to session highs towards the sunset of the American trading hours. “Now, if we do break 1.5840 on the topside we should be able to carry on higher with 1.5880 to 1.5910….If above 1.5910 we see 1.5940/50 but this should be the top and we would expect some strong selling pressure here”, she concluded. On Thursday, the post-BoJ rally of USD/JPY continued unabated. Almost all news was considered USD/JPY supportive. In Europe, the dollar profited from uncertainty on the Greek debt deal. Later in the session, USD/JPY was the exception to a broadbased correction of the dollar as sentiment on risk improved. USD/JPY closed the session at 78.94, compared to 78.43 on Wednesday evening. Overnight, USD/JPY cleared the 79.00 barrier. This time, the constructive sentiment on risk continued to support the USD/JPY cross rate. The pair might get further support from a rise in core bond yields. So, a test of the key 79.55 (post intervention high) might be on the cards.